Kromtech Alliance Corp., the development company of MacKeeper, announces the official launch of its first iOS app, Track My Mac. The demo version of the app has been introduced at Pepcom and CES 2016 in Las Vegas. Track My Mac is a new iOS app by Kromtech Alliance Corp. that helps find the missing Mac, locks and unlocks it remotely, and gets an iSight photo of the intruder in case of any unauthorized entry attempt. It is designed to facilitate the process of recovering lost or stolen Macs with an iPhone. Unlike other anti-theft applications, which can only retrieve the location of a laptop, Track My Mac gives its users more functions: it can lock the screen of the stolen Mac directly from the iPhone and vice versa; it even can make the iSight photo of the person who tries to log in to the system. Moreover, the program is completely free for all MacKeeper users. 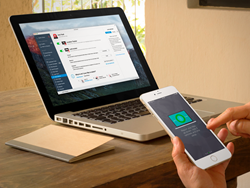 OS X and iOS have become connected like never before, that’s why MacKeeper is extending its functionality and makes it possible for users to access their accounts both on Macs and iPhones. Track My Mac was designed as an additional MacKeeper tool in order to enhance the Anti-Theft functionality and make it accessible from mobile devices. It works in conjunction with MacKeeper’s anti-theft feature, that’s why to start using it, both programs should be synchronized. After the devices are connected, the user can control the status of the laptop. And in case of loss or theft, the report with location details and snapshots will be sent directly to the user’s iPhone and is automatically updated. “The technology of tracking your Mac with the iPhone is not innovative itself, but we offered our users an opportunity to lock and unlock their Macs with one touch on their iPhone screens. This option can secure a lot of valuable information that is stored on Mac. Moreover, Track My Mac users can receive snapshots of an intruder after every login attempt. We are proud to give MacKeeper customers the opportunity to enjoy all these features for free," says Alexander Kernishniuk, CEO of MacKeeper. All-new MacKeeper™is an award-winning service with 17 advanced Mac utility tools and the Human Inside feature. Interaction with technical experts is built into the software interface, which differs from the standard customer support/call center model, so the customers no longer need to look for support phone numbers or email addresses.